Infant hip dysplasia, also known as developmental dysplasia of the hip (DDH), or "clicky hips" can be difficult to detect. Early diagnosis yields the most favourable outcome. It is referred to as a silent condition, as there may be no obvious signs or symptoms. 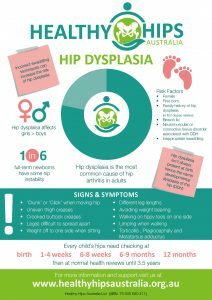 The following infographic lists some potential indicators of infant hip dysplasia. Please note the presence of these, does not mean your child has hip dysplasia. Further evaluation with your GP or a child/maternal health nurse is recommended. The hip joint is made up of a ball and socket; the femoral head of the thigh bone (femur) is the ball and the acetabulum of the pelvis is the socket. Loose ligaments around the joint can allow for misalignment of varying degrees to occur. The hip joint is classified as displaced when the ball and socket do not fit together in their 'normal' position. Sometimes this is due to abnormal development and/or lack of growth. Page Reviewed: 7 April 2018. Information sources available here.